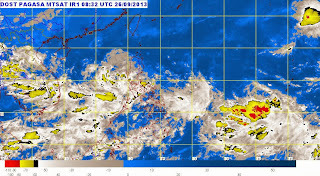 The low-pressure area estimated at west of Subic, Zambales, became tropical depression and PAGASA gave the codename as 'Paolo,' state weather bureau reported on Thursday, September 26, 2013. Bagyong Paolo has maximum winds of 45 kilometers per hour (kph) near the center and is forecast to move west at a speed of 7 kph. PAGASA said that bagyong Paolo is still too far to affect any part of the country, but southwest monsoon (habagat) effects the areas of Zambales, Bataan, Mindoro and Northern Palawan, they will have moderate to occasionally heavy rains and thunderstorms. PAGASA did not raised public storm signals, so far. For the meantime, please bookmark this page now or visit this site more often for you to be updated. You may also share this post to your friends so they may know about Bagyong Paolo Update on Thursday. Comments or suggestions about "Bagyong Paolo Update on Thursday, September 26, 2013 " is important to us, you may share it by using the comment box below.